Floor plan design program helps you easily draw floor plans in minutes. Free download floor plan design program to start your floor blueprint. Most of us do not make drawing to some scale or designating distance easily. So they need to find some simple floor plan design programs on the web, however, all they can find is software intended for 3-D design. No worries, floor plan designer is the right floor plan program for you. Most often, the designers have to select shapes before you can do other things, such as move, rotate, or resize shapes. In Edraw, you can select several shapes at a time, by area, with the lasso tool, or select all the shapes on the page. Click here to download free floor plan program. 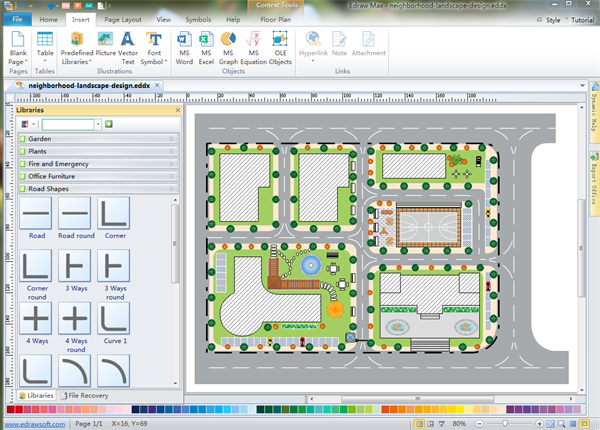 You can use the built-in templates to create and present your floor plan design in minutes. Check out floor plan drawing right here. Edraw Max floor plan program includes massive built-in floor plan symbols which will surely facilitate your drawing of home blueprint. Moreover, many free printable floor templates and examples are available to free download and edit, so that you can make them your own quickly. It's great floor plan design program that can use to create different event space set-ups and use them to show as examples to clients. If you have a dream home, you can draw it with this program. It is a small software but versatile. I have been searching this kind of floor planner for quite a long time, finally I got it. Thank you. It helps me redecorate my kitchen, I love it!!! Use the program to design a wardrobe for my wife and she loves it. Thanks!